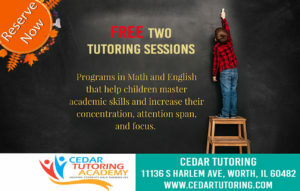 Cedar Tutoring Academy is a platform created by well-meaning and versatile teachers for students who want to get ahead. Our test prep services include SAT prep and ACT prep. We get to know our students and work with them to get the desired result— a high score and advancement in knowledge! At Cedar Tutoring Academy, we don’t just dish out set programs to our students. That will be going against what we stand for and limiting your success. Over our 10 years of existence, we have proven that a tailored program works best. We would first learn how you learn, what you need to learn and when you can learn. This allows us to streamline better your tutoring to bring greater and desired results. Our teachers are experienced and are actual teachers who care for the future of our students. We would work with you every step of the way. We would encourage you and together create a solid ground for you to garner an excellent score in your SAT and ACT exams! Here at Cedar Tutoring, the curriculum we use is both tailored to your needs and aligned with SAT and ACT demands. This means that by excelling in our test preps, you are on a one-stop shuttle towards acing your exams! For us, we believe that critical moments like this in your life shouldn’t be giving to the game of chance. Hence, we have taken every necessary step to secure a win for you. Make sure you come with a mind to win! To succeed in life, we all need more than knowledge or academic excellence. Some personal skills need to be gained and harnessed to ensure true victory in our endeavors. Here at Cedar Tutoring, our vastly experienced teachers are ready and will aid you in developing these skills. Our students who approach any of our prep programs come out with academic skills, the right test-taking strategies to win, time management abilities, the ability to handle heavy workloads, and much more! Let’s work together today for a chance to a brighter future! Many come out to offer individualized service, but they have it off in their proportion. There is only an amount of student that a teacher can provide full attention to at a time. We understand this and have built on it. Going through all our tutoring centers, visitors will find only one teacher to three students. This occurrence is not to show off, but to meet the individual needs of our pupils truly. While others boast of a 5 to 1 teacher to student ratio, our lovely and vastly experienced teachers are matched with the right students. They then go ahead to explore unique ways to boost our student’s performance rapidly. This method has proven really successful for us and our bright minds. We love to help you too! Cedar Tutoring doesn’t continue to assist students in excelling by just dishing out strategies and tutoring programs. Just as it is important for us to get it right with each of our students, we also want to see results! Hence, we have worked on various examination methods to see the response of our students. These evaluation exercises include proctored tests, questions, class assignments, and homework. We don’t judge and make our students lose confidence in their performance in our examination exercises. Instead, we use it as a great pointer to discover better ways to aid and fully improve the skills of our students. This way, we continue to provide tailored attention, tutoring, and encouragement that end up yielding incredible results. Join us today to get ahead.